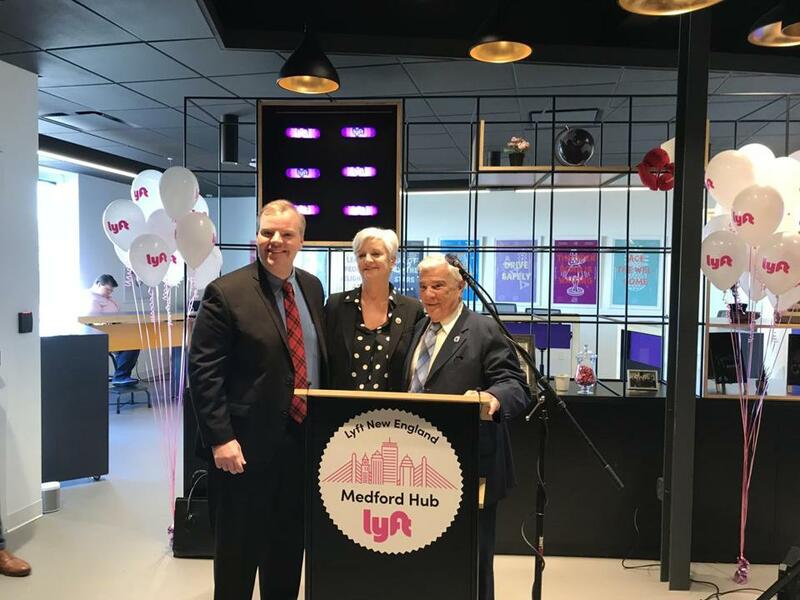 (From left) State Representative Sean Garballey, Mayor Stephanie M. Burke, and state Representative Paul Donato at the new Lyft Hub in Medford. Lyft recently unveiled a new hub in Medford for its Boston area drivers and customers. Medford Mayor Stephanie M. Burke and area state lawmakers joined officials from the ride hailing company at a ceremony marking the opening of the facility, located in a building the company recently acquired at 616 Fellsway. According to the company, the Lyft hub is a place where Boston area drivers and customers can receive face-to-face support for all their driving and riding needs. Local businesses also are encouraged to visit the facility to build relationships with the company, according to Lyft, which said it hopes to create a strong community presence within the Greater Boston area. The hub marks the 12th Lyft Hub in the country. Lyft previously opened hubs serving Atlanta, Chicago, Las Vegas, Los Angeles, New York, Phoenix, Portland, San Francisco, Seattle, and Washington, D.C. In 2017, Lyft and Uber provided a combined 65 million rides across Massachusetts, 35 million of them originating in Boston.